On Sunday Galileo executed a close flyby of Europa for the last time during the current mission. Feb 2, 1999: JPL scientists reported yesterday that the Galileo spacecraft executed a close flyby of Europa on Sunday, passing a scant 894 miles above the surface of Jupiter's frozen moon. Early indications are that the maneuver was a success and that all scientific data were stored on the spacecraft's tape recorder for later playback. Right: Artist Duane Hilton's concept of Galileo as it flies by Europa on Jan. 31, 1999. This latest flyby is the last of a series that began in late-1997 as part of the extended Galileo-Europa Mission (GEM). 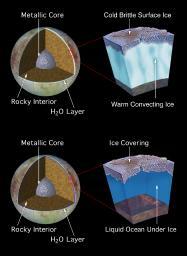 Scientists are intrigued by Europa because of mounting evidence that a liquid ocean exists beneath its frozen surface. Although the moon's surface temperature is a chilly -260° F it's possible that warmth from a tidal tug of war with Jupiter and neighboring moons could be keeping large parts of Europa's ocean liquid. Tidal friction from Jupiter is also thought to be responsible for volcanic activity on Europa's neighbor Io. The picture below, right is an image from Europa's southern hemisphere. The brown, linear ridges extending across the scene are thought to be frozen remnants of cryo-volcanic activity. "Cryo-volcanoes" (cold volcanoes) occur when liquid or partially frozen water erupts onto the Europan surface, freezing instantly in the extremely low temperatures so far from our sun. A geologically older, smoother surface, bluish in tone, underlies the ridge system. The blue surface is composed of almost pure water ice, whereas the composition of the dark, brownish spots and ridges is not certain. One possibility is that they contain mineral salts in a matrix of high water content. 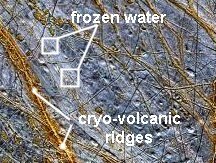 Right: A close up view of the volcanic ridges and areas of blue that scientists believe are frozen water on Europa. Galileo will continue to study Europa from a distance during the second half of the Galileo Europa Mission, but no additional close flybys are planned. However, NASA scientists have several projects in the planning stages to explore Europa from close range. One is the Europa Orbiter. 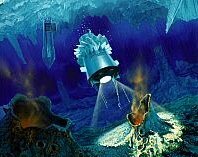 It would use a radar sounder to study Europa's icy surface and attempt to determine the thickness of the ice and whether liquid water exists below the ice. 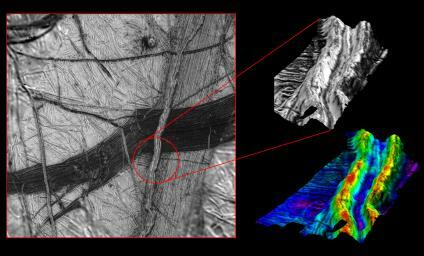 Other instruments to study the surface and interior would include an imaging device with multiple filters to map the surface at a resolution of 100 meters and an altimeter to measure the topography and characterize the tidal response of the surface. The mission could launch in 2003 and would serve as a precursor to spacecraft that would actually send undersea explorers into the Europan oceans. Other missions on the drawing board include Icepick, the Europa Ocean Observer, and the Europa Lander. So far only the Europa Orbiter has been funded. It will serve as an important precursor to future missions to Jupiter's enigmatic moon. Above: These images reveal the dramatic topography of Europa's icy crust. North is to the right. An east-west running double ridge with a deep intervening trough cuts across older background plains. The numerous cracks and bands may indicate where the crust has pulled apart and sometimes allowed dark material from beneath the surface to well up. A computer generated three dimensional perspective shows that bright material, probably pure water ice, prevails at the ridge crests and slopes while most dark material is confined to lower areas such as valley floors. More information from the Planetary Photojournal. See also this image of Astypalaea Linea, a slip-strike fault on Europa similar to the San Andreas fault on our planet. The Jet Propulsion Laboratory, Pasadena, CA manages the Galileo mission for NASA's Office of Space Science, Washington, DC.